Maestro van: Dreadfully nice – HubNut – celebrating the average! There’s no escaping it. The Maestro van really is a bit rubbish. It’s very likeable rubbish though. I’ve covered over 260 miles in it since purchase now. 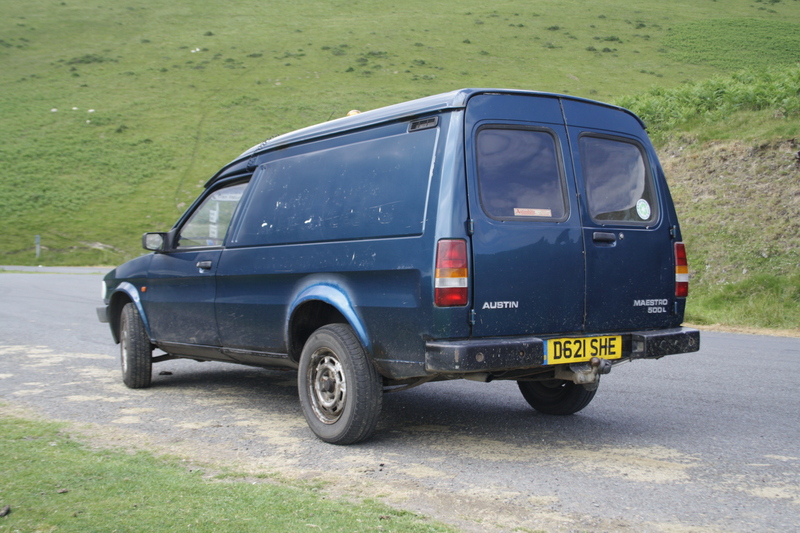 It is far nicer now I’ve sound-deadened the rear with carpet, though it still bangs a bit over bumps. It really isn’t exciting to drive though. The only buzz I get is that it’s all so simple, yet so effective. The driving experience is as awkward as the looks. 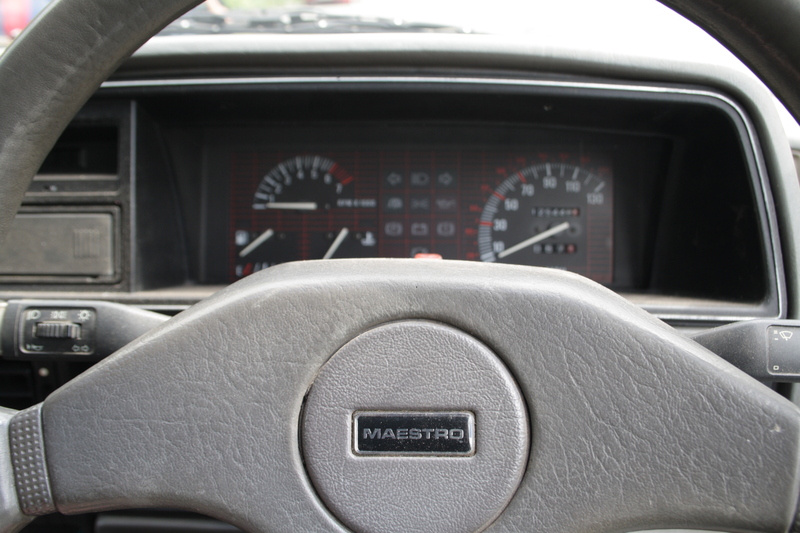 The Maestro was never a pretty car, and it isn’t exactly a pretty drive either. The steering is nice and direct, but the front suspension geometry is such that it doesn’t encourage you to push it. A least, I think it’s the geometry. It just feels slightly like it’s going to fall over its front wheels if you push to hard. Or will just readily understeer. One of the two. That’s ok though, as you can settle back and enjoy a fuss-free, if unexciting drive. It gets you where you want to go. It has a lot in common with my old Nissan Bluebird really. Comfortable, able but dynamically inferior to an equivalent French car. In the Bluebird’s case, the main problem was that I owned a Citroen BX, which trumped it entirely for both ride and handling. The Maestro is only competing with an ancient, peasant-wagon, so it stands a fair chance doesn’t it? Er, no. It doesn’t. Driving the 2CV for the first time tonight since before purchasing the Maestro van reminded me entirely why I love the 2CV so much. It just responds so well to a damned good thrashing! Every corner is a joy. The screaming engine is tiring but hilarious. Ironically, it’s a car I just find impossible to drive slowly. Driving like that all the time isn’t that joyous though. It’s why I was tiring of the Sirion a bit. I had to frenetic little cars that always wanted to go out for a play on twisty roads. I actually quite like having something that is the opposite. With the new quieter back end, the Maestro is certainly more relaxing to drive. That’s good as I’m planning to drive all the way to Bedfordshire in it, via Warwickshire and then Birmingham. Then back home. It’ll be a great test for the van and a chance to see whether we really bond. With that in mind, I thought a service might be on the cards, as the oil wouldn’t look out of place in a neglected diesel. A trip to the motor factors provided oil and filter. Anything else would have to wait (air filter, spark plugs) until funds allow. Sadly, after I drained the oil, I discovered that I’d been supplied with the wrong oil filter. When you live 12 miles away from the motor factor, this is considered a pain in the arse. The van is currently sitting in my garage with no oil in it. I’ll have to try and get a replacement tomorrow. Annoying. Also annoying are the wipers. For a start, they’re very slow and don’t cover enough of the windscreen. Horrific spindle wear seems a large part of the problem here. I need new linkages etc. And possibly a motor. Things have been improved after I splashed out on a pair of new blades though. The second wiper-related issue is the stalk. It has three positions. Off, slow and slightly less slow. No flick wipe (a permanent bug-bear of mine) and worse, flicking to slow and back off turns on the intermittent setting! Unless you ‘flick’ very slowly. This is beyond annoying. I may well have to investigate fitting a different stalk/relay so I can have a proper intermittent setting and variable intermittent – something I had with the same sort of stalks in the Discovery. Oh well. No vehicle is perfect, or if it is, I haven’t found it yet! So, I shall stick to my usual technique of why bother trying to own a good car? Crap can be a lot more fun, and easier on the wallet. Sure, the Maestro may have wiper issues and be a bit ponderous, but I still enjoy driving around in it. It’s different, efficient, practical and not too unpleasant. I could have got a job in sales with lines like that. I found the same steering issue with my Ledbury. There is a knack to really caning it into corners if you must but be warned that even the slightest bit of damp will cause a lot of understeer. Couple that with the leaf springs and the van’s ungainly shape and it could all get a bit wayward a bit too easily I think. Yes. I think that knack is to not do it! I must concede that at times yesterday, I was starting to miss the BX’s cornering prowess. And suspension.